This new generation of DVR supports HD-over-Coax cameras (HD-SDI). These cameras send 1080P video signal over a traditional RG-59 or RG-6 coaxial cable. All of our HDVRs and HDVR cards come with our AVM software, providing optimum video recording, remote access and playback. Our AVM software leads the industry in easy access to your video, even allowing you to scan through days of video in a matter of seconds. The remote access is second to none, with iPhone, Android, BlackBerry, Windows Phone, PC and Mac clients that are highly evolved for instantaneous Real-Time access to all of your video, and built-in zooming to get the full quality. These PCIe DVR cards install into a Windows 7 or 8.1 PC (x32 or x64) and turn that PC into an HDVR that will record from HD-SDI Cameras. 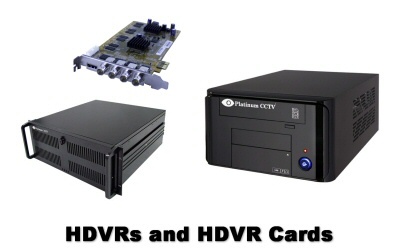 Simply install the HDVR card into your PC and install the included AVM software. For those who want to record from HD-SDI cameras, but don't want to use their own PC, our HDVRs are the best choice. These DVRs are hand assembled and include the AVM software for best recording, video searching and remote viewing (same software as included with HDVR cards).